Not a picture from a spacecraft. 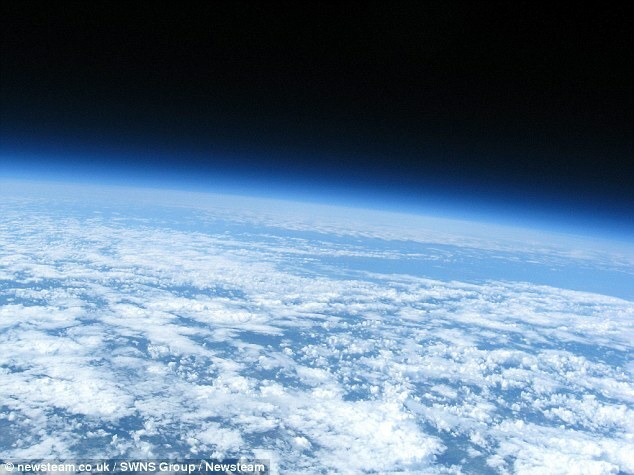 Adam Cudworth, 19, of Ombersley, Worcestershire, managed to capture these incredible views of the earth from space - using little more than a balloon and a second-hand £30 camera bought on eBay. With a scientific background consisting of just a physics A-Level, Adam spent 40 hours working on a homemade box with a GPS tracker, radio and microprocessor - which he released last Thursday. After taking two-and-a-half hours to float more than 20 miles up into the earth's stratosphere, the impressive device captured these amazing views from space. He used a GPS tracker similar to a car's satellite-navigation unit to follow its progress and located it with a radio transmitter following its fall back to earth, having reached speeds of more than 150mph. However how far is it from being able to do that to somebody settingan engine on it and getting it to fly with an explosive payload, using GPS, into a particular target, anywhere within a hundred miles. Neil, are you following the LOHAN project in the Register? They also did something like this with their paper plane in space. Thanks Ivan I have now bookmarked it (though the Register's headline writer seems to be unduly influenced by Carry On films. I did previously write about a by balloon to orbit scheme http://a-place-to-stand.blogspot.co.uk/2011/11/big-engineering-46-hypersonic-airship.html quite favourably but admitting I didn't know enough about it. If technically feasible it looks like a good way to go. Quite a long way. You have two problems - targetting and explosive yield. Getting the carrier above the target probably isn't that much harder, relatively, than what Adam achieved. However, getting sufficient explosive to land sufficiently close to your target to do it material damage, and detonate at the right spot, is a problem of a completely different magnitude. See, for example, the Blitz. In the early 1940s the RAF counted any bomb that got within 5 miles of the target a "hit", which is why they went for city bombing.. Within a couple of years they could knock out dams. I would also point out that GPS can tell a vehicle or bomb how high up it is.